← 1. East meets West, where? How are we to remember Nelson Mandela (1918–2013). Should it be as the world’s most celebrated prisoner or as South Africa’s first black president? Should it be for his vision, his compassion, or for his strong will? Knot of Stone looks at his historical role as the “tree shaker”and the friends with whom he shared his past lives. Among the various clairaudient messages published in Knot of Stone is one by the revolutionary pharaoh Akhnaton and the enlightened emperor Kublai Khan. They praise Mandela for his remarkable leadership during Egypt’s Eighteenth dynasty and China’s thirteenth century, and draw specific parallels to recent South African history. We highlight those parallels here. Akhnaton and Kublai Khan’s message was dictated unexpectedly over Easter 1996 and faithfully transcribed by the South African psychiatrist Dr Laurence Oliver. Cited in Knot of Stone Chapter 94, the contents reflect neither the personal nor the political views of the clairaudient, the author or the publisher. General Horemheb (left) c.1307BCE, from a tomb pillar at Saqqara; Nelson Mandela (right) c.1961, photo by Eli Weinberg. The photograph of Mandela was taken while he was in hiding, which is why a bedspread and not a traditional blanket was used to cover his left shoulder (a custom usually reserved for Xhosa chiefs). 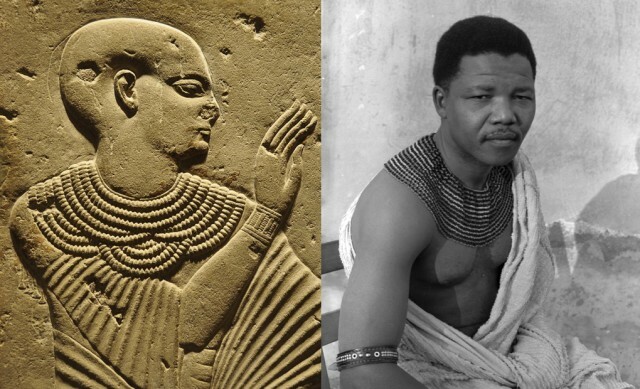 Note the similar beaded neckpiece worn by Horemheb and Mandela. Mandela’s given name, Rolihlahla, literally means “tree shaker” or “trouble maker”. Both Horemheb and Mandela shook their nation and took power through popular uprisings. Both set about transforming internal power structures and curbing abuses by the state. Both appointed new judges, re-established order and ruled a divided people (Horemheb over Upper and Lower Egypt, Mandela over White and Black South Africans). Both men initiated a culture of reconciliation. Curiously, each had two tombs prepared for them. Horemheb chose the necropolis of Saqqara at Memphis but was, instead, buried in the Valley of the Kings on the opposite side of the Nile. 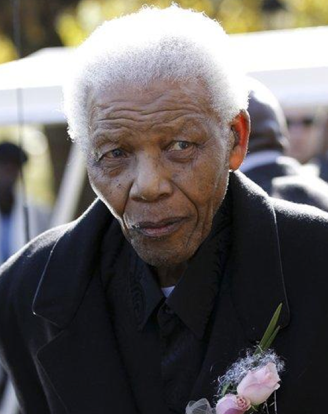 Mandela, as per his request, will be buried in the rural village of Qunu, twenty kilometres from where a second family tomb had been prepared for him. 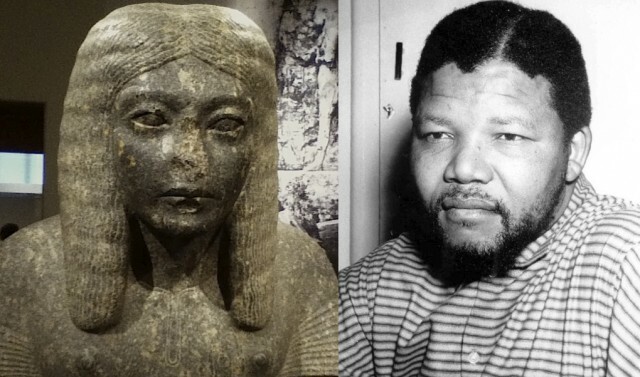 A scribe and a lawyer, General Horemheb (left) and Nelson Mandela (right). The photograph of Mandela was taken while he was on the run and staying in Wolfie Kodesh’s flat in Johannesburg, late 1961. Courtesy BBC. The statue of Horemheb dates from the 2ndC BCE and resides in the Metropolitan Museum of Art in New York. 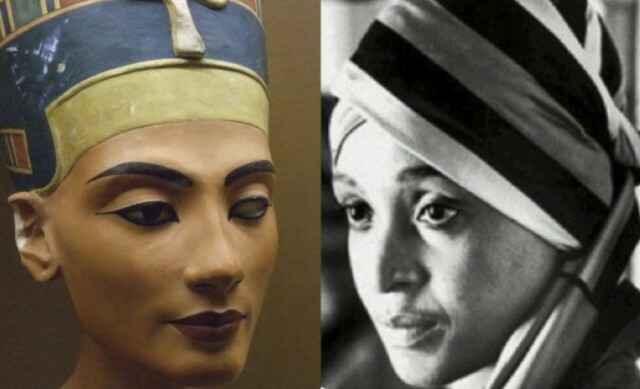 The iconic bust of Nefertiti (left) by Thutmose, 1345BCE, from the sculptor’s workshop in Amarna, Egypt, now in the Neues Museum, Berlin; and a portrait of Winnie Mandela (right) from 1975. Photograph courtesy Avusa. The reputations of both women were marred by allegations of abduction involving young boys. Two defining moments: First, Cyril Ramaphosa (left, wearing a green tie and holding the mike) watches Nelson Mandela deliver his first public speech after his release from prison in 1990. Photograph by Chris Ledochowski. 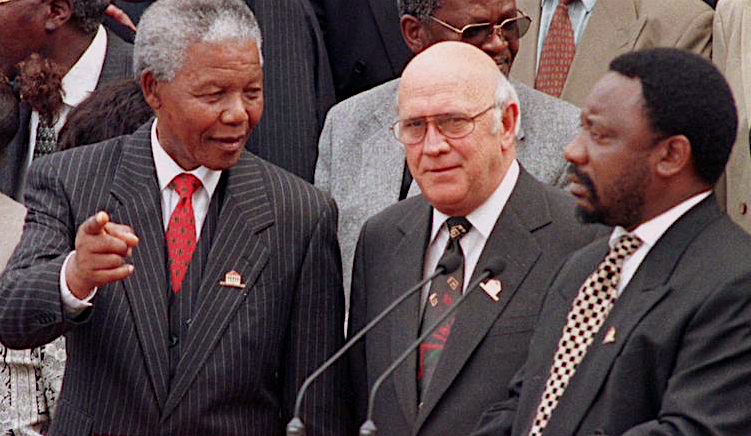 Second, Cyril Ramaphosa (right, now wearing a red tie) watches Nelson Mandela sign the new Constitution in 1996. Photograph by Charles O’Rear. These moments were the culmination of pivotal talks, both private and partisan, that set South African history on a new course. Helen Suzman (left) visits Nelson Mandela at his Soweto home in 1990, following his release earlier that year. For more than a decade, Suzman was the only MP to openly condemn the whites-only Apartheid regime. Photograph by John Parkin. President Jacob Zuma (right) celebrates Nelson Mandela’s 91st birthday at his home in Houghton on 18 July 2009. Photograph courtesy of the BBC. Pharaoh Amenophis IV Akhnaton (left) 1375-1358BCE, fragment from a monumental statue in Karnak, Egypt. Courtesy of the Egyptian Museum, Cairo. Kublai Khan (right) 1215-1294, as painted by the court astronomer Anige shortly after the emperor’s death. Courtesy of the National Palace Museum in Taipei, Taiwan. The emperor and a president, Mongka Khan (1209-1259) and Nelson Mandela (1918-2013). Mongka was the first Great Khan from the Toluid line and made significant reforms to transform the Mongol Empire, earning him the title of Supreme Khan and King of Kings. 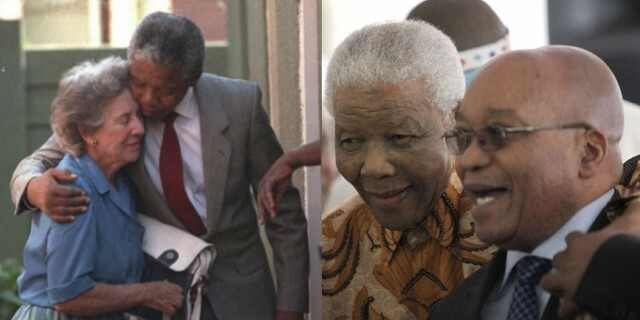 Likewise, Mandela has been hailed the President of Presidents. 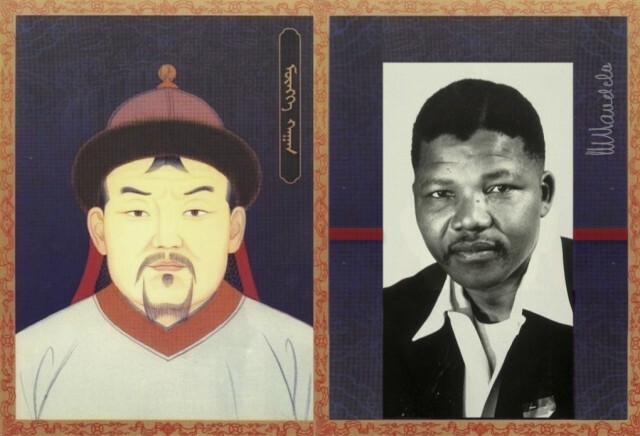 The 13thC painting of Mongka shows a cartouche with his name in traditional Mongolian script, while Mandela’s signature appears alongside the photograph of him from c.1957. While Mogka held court, his brothers re-expanded the Mongol empire. Batu (Botha) used his Golden Horde to occupy Russia and eastern Europe; Hulagu (Buthelezi) conquered Persia; and Kublai Khan established the Yüan Dynasty. Kublai Khan is reincarnate today as Tenzin Gyatso, beter known as His Holiness the Dalai Lama. Please see our related post on the karmic connections between the Dalai Lama, Tutu and Mandela. The Dalai Lama (Tenzin Gyatso), Desmond Tutu, Nelson Mandela, Thabo Mbeki and Mangosuthu Buthelezi. 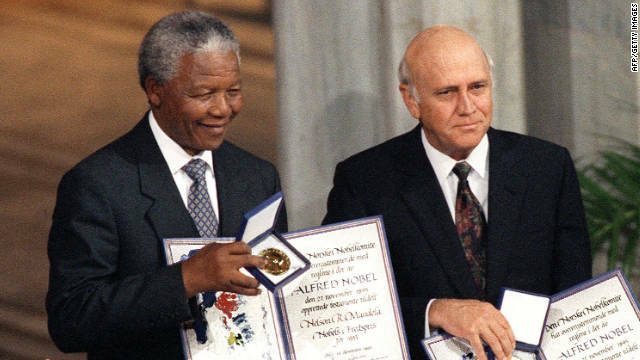 Nelson Mandela and FW de Klerk, Nobel Peace Laureates, in 1993. Both men took an extraordinary leap of faith, together, thus changing the course of South Africa’s history forever. This joint award acknowledged their shared roles in the country’s historic path to reconciliation. Sadly, the road is far less travelled today. Three presidents cut from one cloth? From a karmic perspective, Mandela, FW De Klerk and Ramaphosa were successive pharaohs, namely Horemheb, Ai and Ramses I. Ai (today De Klerk) was an advisor to three preceding pharaohs and stood up against the unrest and upheaval in the country following the reign of Akhnaton, calling for reconciliation to restore stability. He prepared the way for Horemheb (Mandela) as his successor. In turn, Horemheb was succeeded by Ramses (Ramaphosa). As for Zuma, finally, we should say that he reappeared in Kublai’s court as Ahmad Uzma who, judging by his name, appears to have come from what is now Uzbekistan. He rose to the position of finance minister, taking advantage of his master’s misplaced trust and the distractions of civil war. He was reputedly a corrupt court official and, too, renowned for his many wives. Though accused of murder, the Grand Khan sidelined all attempts to impeach Uzma and kept him at court. Despite this Uzma’s abuses of power did not stop and, like Zuma today, had to face charges for capitalizing on arms-deals. 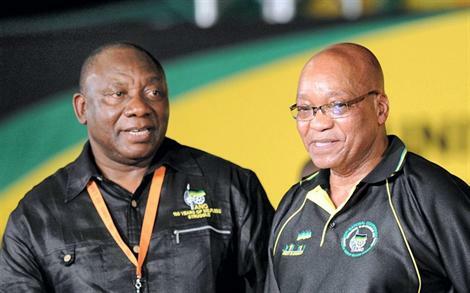 Cyril Ramaphosa and Jacob Zuma at the African National Congress conference in Mangaung on 18 December 2012. Following a dramatic election battle, Zuma swept to victory as president of the ANC and secured a second term as party leader, while outsider Ramaphosa was elected as deputy president. Their bond goes back to ancient Egypt when they were Amenite priests at Memphis and Thebes, respectively. Photograph Ouest France. As Mandela’s given name suggests, let’s remember Rolihlahla as a true Tree Shaker. Wonderful presentation. The picture links are breathtaking. I assume you’ve sent them to the clairaudient who transcribed the messages? No, not yet, but perhaps I should, as it’s such an auspicious day.